Some readers may recall that the operator first unveiled details of their patent-pending Air Mast solution earlier this year (details), which uses airborne balloons (Helikite) and drones to help keep people connected (useful when responding to network outages or for delivering coverage to special events etc.). 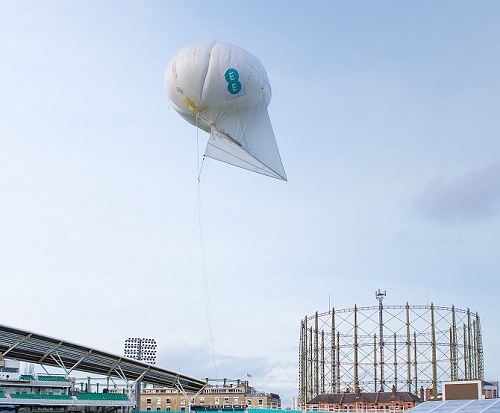 In this case EE modified one of their Helikite balloons to use the new pre-5G backhaul technology (the demo used the 26GHz band to connect a Parallel Wireless small cell on the Helikite to an Athonet virtualised Evolved Packet Core (EPC) on the ground using a PHAZR link), which helped to increase 4G network speeds and lower latency within the coverage area. Simply making use of the millimetre wave (mmWave) frequencies (26GHz) isn’t true 5G but it does form a key part of the same standard and so represents a useful test of future technology. Sadly we haven’t been given any details about precisely how fast the service ran (before and after the upgrade) or over what distance. The test itself was conducted at BT’s Adastral Park Innovation Week event. I recently got 350mbps on their 4G in Cardiff on a ZX Premium, so I can believe that. As Mark suggests this has nothing to do with 5G, using the 26GHz band for backhaul is no different to what CCS have been doing fro small cells backhaul in the 28GHz band. As per RSPG the 26.5GHz band is a 5G candidate band, that means for access using handsets or MiFi like equivalents – not backhaul.